Birthday wishes for nurses: There is nothing better than an inspirational quote for a nurse’s birthday card. It is the perfect way to make a nurse feel good about the selfless sacrifices that are made every single day. Care, compassion, tolerance and patience are some of the key virtues and traits of a nurse who is really passionate about his or her job. 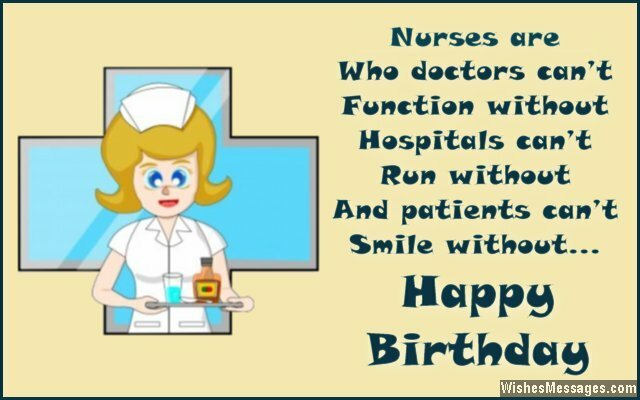 Keep this in mind and weave your birthday wishes around the whole notion of how nurses are often the unsung heroes of a hospital. Your motivational wishes and encouraging greetings will be the perfect way to say Happy Birthday to someone whose life revolves around caring for others and helping people heal. 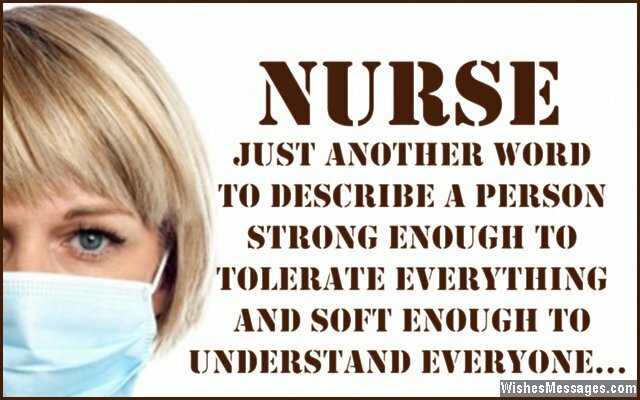 1) NURSE – just another word to describe a person strong enough to tolerate everything and soft enough to understand everyone. Happy birthday. 2) Being a nurse is a tough profession. Your birthday is your chance for some relaxation. You care for all your patients tirelessly. This is your moment to be pampered endlessly. Every day you give people the gift of hope and care. Today, let’s celebrate your birthday with a little bit of flair. Happy birthday. 3) Warnings and prescriptions are what doctors give, care and compassion are for what nurses live. Happy birthday. 4) Doctors can prescribe medicines, but only nurses can prescribe hopes and smiles. Happy birthday. 5) In technical terms it is said that nurses have a plan of care, but in layman terms it just means they have lots of love to share. Happy birthday. 6) People may come into hospitals as strangers but a good nurse can make them feel like family. Happy birthday. 7) Doctors claim to cure. Nurses don’t make any claims – they just care. Happy birthday. 8) A break from annoying doctors’ orders, a respite from abusive patients. A reprieve from gossipy colleagues, a day away from the stressful moments. Enjoy the time off on your birthday, cherish the serene calmness. Let your friends and family pamper you, because today is your slice of happiness. Happy birthday. 9) A nurse’s smile is often more comforting than the doctor’s drugs. Happy birthday. 10) The voice of a nurse can often go unheard to the ears. But her caring touch is always felt by hearts. Happy birthday. 11) There are some things that nurses carry which can be highly contagious – smiles, laughs and a positive attitude. Happy birthday. 12) As a nurse your life may be thankless and tough, but always remember there is someone out there who just can’t bless you enough. Happy birthday. 13) It takes strong will power, patience, hard work, selfless commitment, abundant love, sense of care, passion and a thorough understanding of human emotions to be a nurse – and you have all of that. Happy birthday. 14) Happy birthday to the nurse who cares for patients just like the way she would want to be cared for by another nurse. 15) Doctors may have fancier degrees but nurses have bigger hearts. Happy birthday. 16) Nurses are who doctors can’t function without, hospitals can’t run without and patients can’t smile without. Happy birthday. 17) For what you do every day, there is always someone out there who blesses you. Happy birthday. 18) Nurses have uniforms because they are angels in disguise. Happy birthday. 19) You may think that you are an unsung hero, but in reality patients think about how your beautiful smile lit up their day for years and years. You may feel that you are never rewarded enough for your work, but the people you care for every day will keep blessing you for the rest of their lives. Karma is on your side, my dear. Happy birthday. 20) Nurses – the heart of a hospital. Happy birthday. 21) Nursing is a profession that everybody can claim to do but nobody can. Happy birthday. 22) It takes strength to be a builder, it takes talent to be a painter. It takes skill to be a sculptor, it takes vision to be an entrepreneur. It takes intelligence to be an inventor, it takes hard work to be a laborer. But to be a nurse it takes all this, plus the compassionate virtues of someone who is a true carer. Happy birthday. 23) Nurses may have more responsibility and less authority but at the end of the day, nurses are the hard-working souls who shape people’s destiny. Happy birthday. 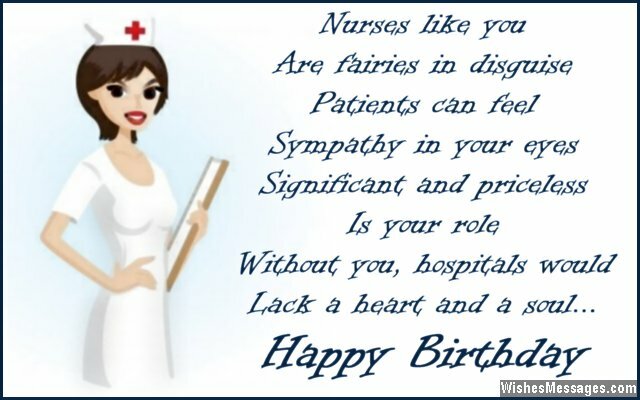 24) Happy birthday to the person who is not just in the profession of nursing, but also in selflessly caring and lovingly healing. 25) Cheers to yet another year in the life of a person who helps save and salvage lives of many other people every single day. Happy birthday. 26) A lot of people say that nurses have a lot of responsibility yet no authority. That is not true. Nurses have the intrinsic authority to give care, healing touch and say ‘everything will be alright’ – this is what really gives patients something to look forward to. Happy birthday. 27) You infuse people’s lives with the simplest yet one of the most powerful feelings known to man – HOPE. Happy birthday. 28) If life was a movie, doctors would be the lead actors while nurses would be the crew who set everything up for the perfect shot. Happy birthday to an unsung hero. 29) All year round you put aside your own issues so that you can care for patients and listen to their problems. Let’s make your birthday the day when your friends can spoil you silly and rejuvenate you for another 12 months of selfless service. Happy birthday. 30) There are very few professions in the world which can be called inspirational, tough, selfless and caring at the same time – one of them is called being a NURSE. Happy birthday. 31) Nurses like you, are fairies in disguise. Patients can feel, empathy in your eyes. Significant and priceless is your role, without you hospitals would lack a heart and a soul. Happy birthday. 32) Good nurses like you are the only positive side of being sick. Happy birthday. 33) To a dotting mom, loving wife, adorable daughter and a caring nurse – happy birthday. 34) A good nurse like you has nothing to worry about. Karma will always come a full circle and bless you for comforting the ill and helping the sick every single day of your life. 35) When it comes to being a nurse as good as you, unlimited tolerance and patience are not virtues, they are a necessity. On the other hand, care, compassion and concern are not necessities, they are a result of passion. Happy birthday.